Bigger than life itself, Margaret (Molly) Brown's story is not the typical rags to riches one from the Colorado silver mining era. Much has been written (a stage and movie production, too) about this feisty lady with an incredible lust for living life to the fullest. A large, unruly, loud and somewhat earthy woman, Molly longed to be part of the Denver society during the late 1800s and early 1900s. With great wealth from the Little Johnny Silver Mine in Leadville, she and her husband, James Brown (Johnny or J. J.) bought a house in the midst of the affluent Capitol Hill area where many of the Denver 500 lived. As much as she longed to be part of this exclusive few, her money could not buy acceptance and she was often publicly shunned. Hungry for culture and knowledge, Molly spent years touring Europe and sending home her Old World treasures to fill her Denver home. Europeans, including the royalty, found Molly's flamboyant ways charming and fun to be around. Here she became a true socialite. Her notoriety and popularity in Europe never trickled down to Denver, and perhaps this was the reason she only lived in the House at 1340 Pennsylvania Street for a few years. 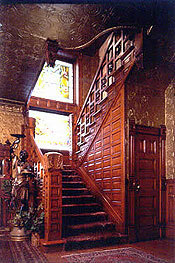 In 1902, the house became Governor James Orman's mansion while the Brown's were on an extended European trip. Mrs. Brown continued to rent out her fabulous house. She preferred to stay at the Brown Palace Hotel when she was in town. Nicknamed "the unsinkable Molly Brown" from her take over attitude as a survivor of the Titanic sinking, and for her unflinching optimism. 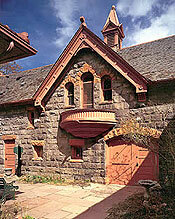 The Molly Brown House in downtown Denver was her failed attempt at Denver Society. Originally built for the Silver Barons, Isaac and Mary Large, the house was designed with an eclectic combination of classic Queen Anne, Romanesque and neo renaissance style. The exterior was constructed with the rusticated lava stone, rhyolite, trimmed with red sandstone and salmon painted wood. Today, the house has been faithfully restored through Molly Brown's photographs of her parties, fragments of old wallpaper, original pieces of furniture and costumes of the era. The interior decor reflect a happy combination from coyote heads and bear rugs reminders of their cabin days to fabulous pieces of art and furniture imported from Europe. Walls are covered with fabric brocade, tapestry and wallpaper similar to paper Mache that caught the light and muffled sound. 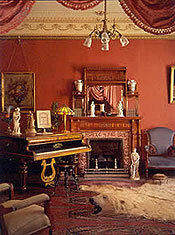 Great visit for the history buff or for just a glimpse of the lifestyle of one of Colorado's famous grand dames. Sunday opens at noon -- last tour 3:30pm. 45 minute tours every half-hour.